A Pizza Hut location in Southeast Asia is about to get a futuristic upgrade. As reported by Mashable, the pizza chain is teaming up with MasterCard to introduce a customer service robot to one of their Singapore locations by the end of the year. If you've been keeping up with humanoid robot news, Pizza Hut's newest employee might be a familiar face. 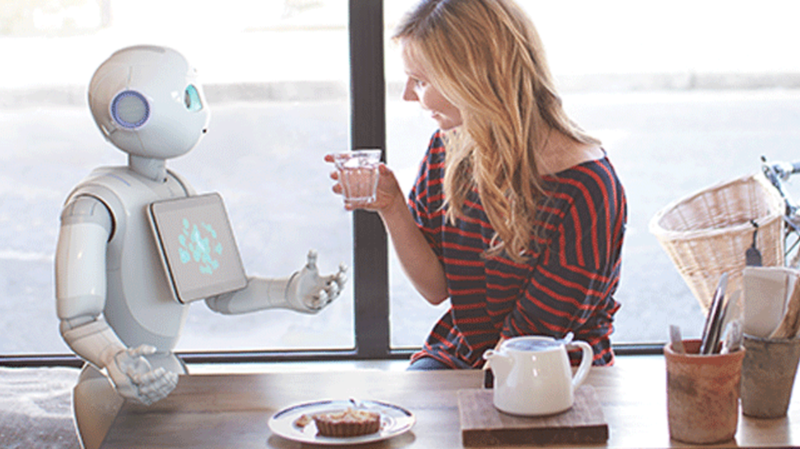 Pepper (as it's called) was unveiled by SoftBank Robotics in 2014, and today the company has the robot stationed in more than 140 of the telecommunication's stores across Japan. According to SoftBank's website, the machine is "capable of recognizing the principal human emotions and adapting his behavior." Now the robot will get the chance to test out its customer service skills for an international restaurant chain. The Pizza Hut Pepper will be responsible for interacting with patrons and assisting them with orders. It will be the first Pepper robot capable of guiding customers through transactions using MasterCard's MasterPass Wallet app. Customers without MasterPass will also be able to make mobile purchases by scanning a QR code. Once you're ready to buy your item, Pepper sends the transaction details to your phone and then tells you where to pick up your pizza once the order is complete. Pepper is programmed to help in other ways as well. If customers have a question regarding a menu item or if they're curious about nutrition facts, all they have to do is ask and the robot will answer. If the pilot run is successful, pizza lovers can expect to see robot attendants in stores across Asia Pacific—though there's still no word on when Pepper might be arriving in the States.